Have you been hearing the term "millennials" lately and wondering what this term really signifies as we attempt to name or identify a new era of generation, or have you wondered exactly what age group falls within this term? According to the PEW research, generational names are the handiwork of popular culture. Some are drawn from a historic event; others from rapid social or demographic change; others from a big turn in the calendar. The Millennial generation falls into the third category. The label refers those born after 1980 - the first generation to come of age in the new millennium. The research highlighted millennials as confident, connected and open to change; and it also stated that Most Millennials (61%) in their January, 2010 survey say their generation has a unique and distinctive identity... As a millennial myself, I admit to feeling this way about my generation having a unique and distinctive identity. It is our uniqueness that inspires me to see the world differently; we are more global, we are more technologically inclined and we are way more self aware, and conscious of how we are living our lives and of the stories our lives are telling just by being alive. I can say confidently that this age of people and not just millennials defined by the PEW who categorize generation lines in age brackets, but generally just the times we are in feels like a verge of tipping evolution where there is massive force of change about to tilt us with its huge wave but in the most liberating and ecstatic way humanity has experienced yet. ART today is the world and the world today by itself is ART beyond our mere comprehension. The global air of change rising and taking over is so prominent you can feel it and even taste it; and it is with this spirit of game changing era filled with game changers and change makers that I desire this project to be built on which is why this work of art in progress is a dedication to those who feel the sort of era we are, a dedication to those who are inspired by the world as art and see the world as art, dedicated to those who see the need for more alive voices, and who see themselves as timeless books being written just by the way they choose to exist and live their lives. This dedication, is to those that feel a need to be heard because they know they matter, it is to those that feel suffocated when they are for the sake of living up to society's standard are not doing what they truly want to do and by society's society's standard I refer to the limited resources we all respectively have access to. I speak this way because it seems more apparent that there are way more talents but unfortunately with less resources or know-how or inspirational pathways hence the major reason why I would like to dedicate this to our millennial generation; I see several us wasting away in our talent and our art. We have this massive array of talents, we have ideas and we are passionate about ourselves and potential we have for the world that could potentially if summed up make the world of course a much better place, we are not just this narcissistic and lazy generation they coin us to be; we waste away much more so because.... because this is the essence of this book to look beyond the why of why we waste away as a generation of multi-talented and multi-passionate generation, but rather to investigate bringing solutions on how we can not waste away any longer, and why we must discover practical ways to live as we desire; a meaningful life, a life where we feel fully alive. We waste away because though we might be awake to the exploding range of potential innate in us, we don't feel fully alive to tap into the perspiration of the subject; the perspiration of the subject is the beautiful and ugly reality of the issue. What is the ugly reality of the issue you face today for why you might be wasting away? This is where "Discovering your own ART of being alive comes in", an hour long series of inquiries we tamper with exploring other journey of individuals who are finding possible answers to the earlier "because" question. This is what I hope to accomplish with the book. 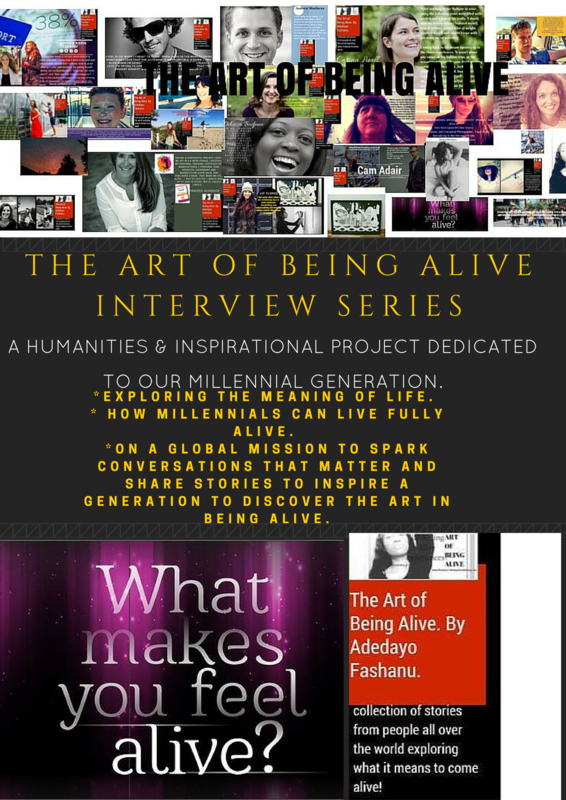 Goal: Inspire more of us Millennials to discover their ART of being ALIVE with this ethnographic and humanities project. Interviews: Our stories matter and hearing through interviews stories of individuals breaking the status quo, finding more meaningful ways to live and inspiring us with their life lessons is the heart of this book. I am not just going to document stories randomly but categorize them into headers that make for a beautiful trail of relevance mixed with story telling in a quintessential and plush kind of way; that reminds us about the essence of life and the inspiration of why our life is ART. I am interviewing people and/or organizations or companies that are doing something meaningful behind their brands. The Art of Being Alive is a true gift of inspiration for what a more conscious society and era we have emerged to become. I have for instance a category where I interview game changers in the field such as those who are creating social change through what they do, other categories that portrays profiles of individuals doing what is called "meaningful work" which i define as work you do where you feel 80% fulfilled doing it plus it is profitable, and another category profiling experts with credentialed opinions who give us snippets of facts mixed with inspiration in the world of topics like mental health, happiness, spirituality, wellness, psychology, and so on. 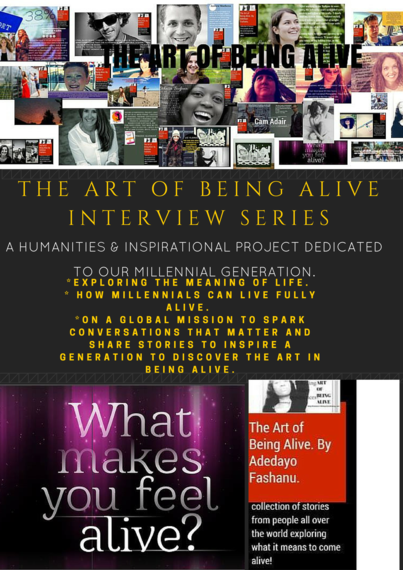 Practicality/ Resources: What matters to me the most with this project once it is completed is that millennials can find it relevant towards discovering their art of being alive which could be resources on books or websites or actual contacts based on what we get from our interviewees . Practiaclity and relavance of this book is what matter so much with this book; to get it in the hands of over a million millennials around the globe who are on a quest just like myself to find what makes them come alive, and to discover their ART of being ALIVE. Indeed it is, and I have no doubt this is a book project relevant for our today's times. The interview is a series of inquiries that sheds light on your art of being alive journey.